Spring fever has struck the crochet community! We collected the top projects of March, and we found that you are crazy for crochet patterns for spring. Afghans and wearables topped the list of our most popular projects last month as folks began making lovely throws as indoor accents with free easy afghan crochet patterns, then began amazing free crochet sweater patterns and more! Sweaters, free crochet jacket patterns and free crochet shawl patterns were particularly popular, and many readers wanted to redecorate their homes with easy crochet afghans. Others just donned a quick scarf and dashed out to enjoy the sunshine and flowers. You chose these projects as your favorite projects for March, so let us know how they turned out! If you didn't get in on the action this past month, subscribe to our newsletter, Hooked on Crochet, so you can help decide the top projects of April. Keep reading to see a roundup of your top picks, and try one of the projects you didn't have time for in March! Our afghans are always popular, but people were so excited to make these afghans in bright and happy spring colors! In particular, our readers wanted to make free easy afghan crochet patterns so they could finish up and head outside for a picnic or a walk in the garden. With spring cleaning well under way, it's nice to toss your winter décor into the closet and replace it with something a little more suited to a bright, sunny day with some of our beginner crochet afghan patterns. 5 1/2 Hour Throw: Make it quickly and head outdoors! Stashaholic's Brain Dead Afghan: This easy free afghan crochet project is so simple, a zombie could make it! Beautifully Designed Afghan and Pillow Set: This gorgeous set is the perfect home décor project. Wavy Shell Crochet Afghan: From the look of things, you're all ready for the beach! Our readers couldn't get enough of our easy crochet afghans, so they loved checking out and making these 14 Free Crochet Afghan Patterns! Also, if you liked these projects, try this Ribbed Ripple Reversible Afghan from our sister site, AllFreeCrochetAfghanPatterns.com! Our readers were thrilled to shake off the winter chill with some lightweight free crochet jacket patterns, free crochet sweater patterns, and a crochet shawl pattern or two for spring. These accent pieces add a little bit of warmth for spring, freeing you up to go experience the birds and blooms in the season of rejuvenation. Breathe in the clear air and experience the bounteous beauty of springtime by donning a dashing drape from the list below. These ponchos, sweaters, jackets and more will enable you to enjoy the weather more comfortably. Ice Crystals Poncho: Just like the ice crystals melting outside, this scarf is great for warding off the lingering chill of winter. Crochet Short Jacket: Thank goodness we don't have to wear huge, puffy jackets anymore! Angel Wings Shawl: You'll look so divine and ethereal in this free crochet shawl pattern. Little Crochet Jacket: This jacket is simple and fun. Cute Stripesd Poncho: Who doesn't love stripes? Spring Crochet Cardigan: Free crochet sweater patterns are great accessories for warm weather walks. 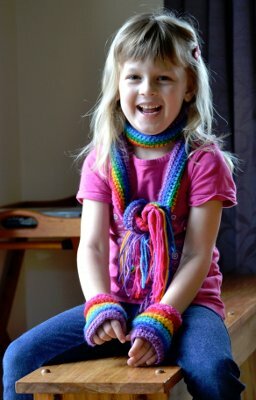 Everyone loves wearable crafts, and March was no different. You chose a few wearable items that are perfectly suited to comfort in spring, from free crochet scarf patterns to the most daring of dresses! Check out this Sleazy Dress if you're feeling daring, or make one of the slick-looking free crochet scarf patterns for a nice addition to a spring ensemble. Dress up for the new season by making these amazing crochet projects that you chose as your favorites from March! Sleazy Dress: Our readers were feeling especially knotty this month with free dress crochet patterns! Rainbow Scarf: Reflect the stormy sunset with this scarf. Dragonfly Wonder Scarf: Frolick in the garden in this classy spring scarf. It's wonderful! What a great idea. I was not aware of this site in 2012 so I didn't see any of these great projects. His nice of you to rerun them so I can catch up with them. I saw a few ideas that I want to try. Thank you so much for this.